I can’t believe it’s that time again! The national convention is just a few days away! I’m feeling so blessed to have the chance to attend this year’s convention in Denver, Colorado. This year is sure to be extra special because Nicole Allison and I are presenting this year for the first time! 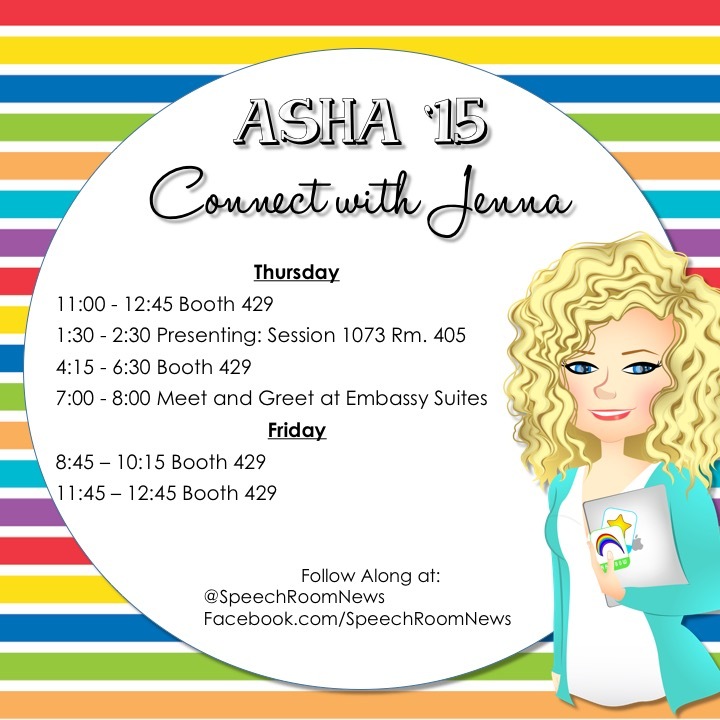 If you’re heading to ASHA I hope you try to find me! I love meeting people who follow Speech Room News. My pals and I will be at booth 429 this year. I’m there Thursday and Friday at random times. Come by and grab some swag! If you happen to see me wandering in a session or grabbing lunch make sure you stop by and chat. I have codes for freebies to hand out while supplies last! 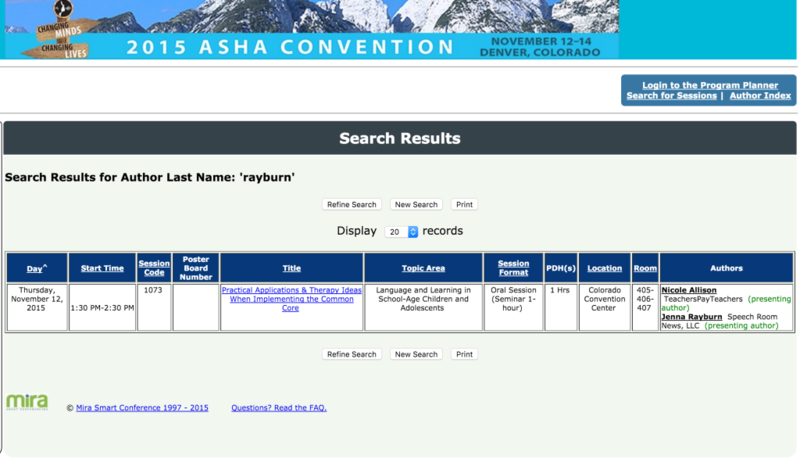 If you’re going to ASHA make sure you take time before you head over each day and look at the program planner. Thursday afternoon at 1:30 Nicole and I will be presenting therapy ideas for implementing the common core. We’re sharing ideas you can take home and use the very next week in therapy. 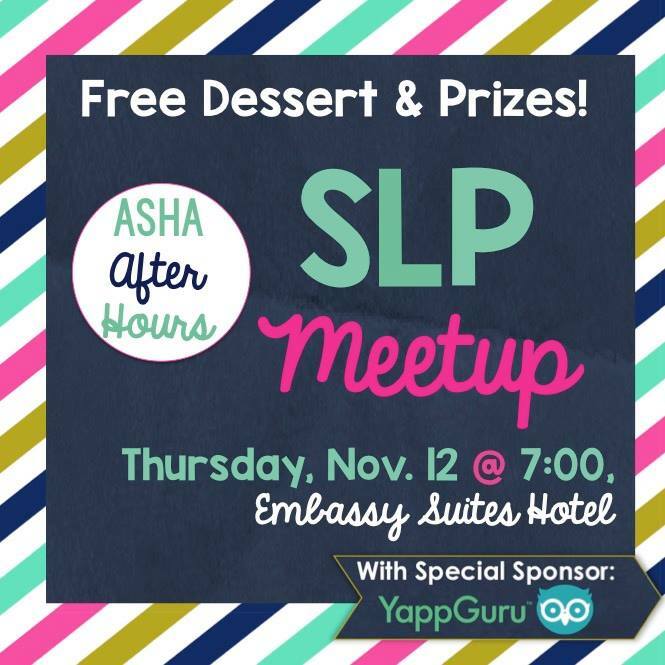 In the evening on Thursday, the ladies of booth 429 are hosting an after-hours SLP meet-up. YappGuru is providing dessert for everyone! We have called in all our favors and grabbed HUNDREDS of dollars in prizes to give away! It will be a quick hour! A few minutes to mingle, raffling off our many prizes, and then dessert! Last year, one of my favorite ways to win prizes at our booth was the Selfie Contest! Once again this year, every selfie you post with the Bloggers of booth 429 will enter you to win a bundle of TpT products! We’ll be the ones in teal shirts, so grab us and take a selfie. 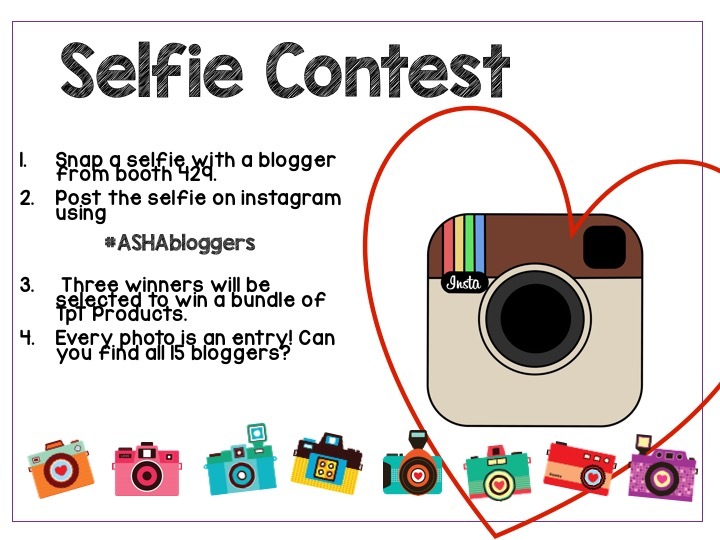 Use #ASHAbloggers in your post and we will pick winners at the end of the conference! So bummed I can’t go to ASHA. It would be wonderful if ASHA had some sessions via the internet for those of us who can’t make it. Maybe in the future! Good luck with your presentation. Wish I was listening to it!